If you needed evidence that tech specs are becoming irrelevant, Intel's ultrabook-obsessed press conference was place to find it. Instead of talking about speeds and feeds, Intel was fixated on slimmer form factors and extra features, as the company showed off upcoming and concept ultrabooks with touch screens, new security features and even gyroscopes. "The question that people ask is, 'what can I do with it, what is there for me, how can it help me to live my life better?" Mooly Eden, Vice President and General Manager of Intel's PC Client Group, said. Intel created the ultrabook laptop category last fall, in response to Apple's Macbook Air and to the casual computing afforded by tablets. Intel wants ultrabooks, which emphasize slim design and long battery life over raw performance, to account for 40 percent of the laptop market by the end of this year. To get there, prices will have to fall well below the $1,000 price point that Intel initially targeted. Eden promised that the cost of ultrabooks will drop this year, but didn't give any specifics. However, Lenovo, which has already shown off some of its ultrabooks at CES, is targeting $700 with one of its models, the U310. Intel is also adding new features to ultrabooks in hopes of making them more desirable than other thin and light laptops. In one demonstration, an Intel employee booked a hotel room on a concept PC by pressing a MasterCard against the touch pad. The feature, which will work only on the user's own PC, uses near-field communications technology, and will appear in future ultrabooks as a way to make secure payments on the Web. Natural input methods, such as touch and voice, will eventually play a role in ultrabooks as well. 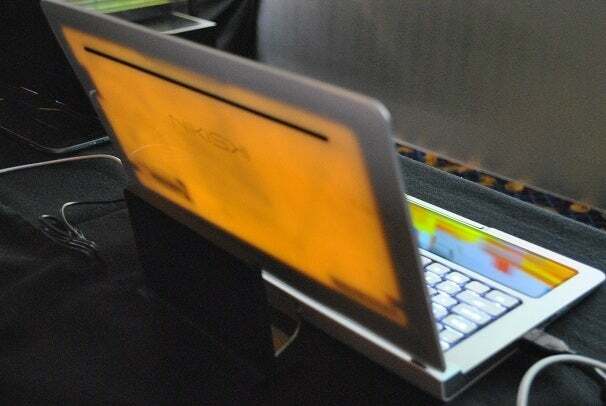 In addition to a standard clamshell laptop with a touch screen, Intel also showed a concept laptop with a dual-sided transparent touch screen instead of a track pad, called Nikiski. When the laptop is closed, the screen shows e-mail, appointments and other important information through the underside of the laptop, using Microsoft's Metro interface. When open, the touch screen functions as a wide trackpad with palm detection. Other concepts included a motion-sensing camera, similar to Microsoft's Kinect, a sliding tablet-laptop hybrid that resembled Asus' Eee Pad Slider, and a laptop with a gyroscope for tilt-based gaming. Perhaps as a response to Apple's Siri and the rise of voice commands, Intel brought the chief marketing officer of Nuance, Peter Mahoney, on-stage to announce a strategic partnership that will bring voice integration to ultrabooks. Intel didn't actually demonstrate any of this technology, however. Intel did spend a small amount of time talking about performance, but the brief tech demos the company showed--a 3D racing game, a wooden bridge blowing up with physics calculations for each piece of lumber, and a smoothly animated model of a 3D troll--only underscored how ultrabooks aren't cut out for high-end gaming. We didn't see any high-end shooters running on these low-powered laptops, for instance. Intel's next computing platform, Ivy Bridge, had only a muted appearance at the press conference. Although some Ivy Bridge ultrabooks will launch this spring, the mainstream push will happen during the back-to-school season. 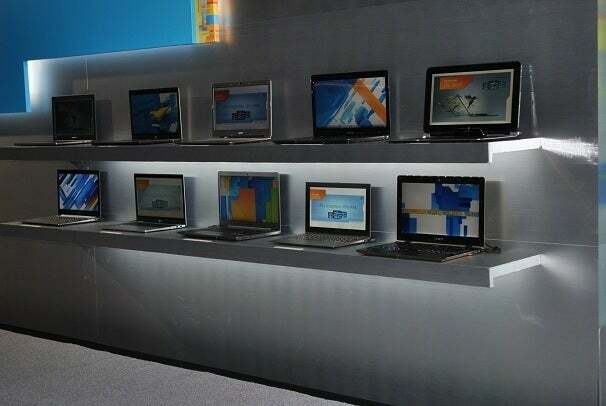 The slew of near-finished ultrabooks on display run Intel's second-generation Core processors, based on Sandy Bridge. Over the next few months, Intel is planning a big marketing push to turn mainstream consumers on to ultrabooks. Kevin Sellers, Intel's sales and marketing vice president, said this will be Intel's most significant advertising campaign since the launch of Centrino processors in 2003. The company is pitching ultrabooks as "a new era of computing," and while some may argue that tablets better deserve the title, you can't argue that thin, light and long-lasting computers have become more desirable to mainstream users than large laptops with beefy tech specs.